Alaina had faced a fair share of Wrestle Angels but never anyone with the clout of Panther Risako. She wanted to show Panther that she was for real, and in turn keep making a statement with another big win. Alaina had been rolling and planned on keeping it that way. She was clad in her tiger print wrestling attire, making her way towards the ramp. Once she heard her music she came bounding out, smiling and waving to the crowd before high fiving fans all the way down the ramp! She was all smiles as she climbed into the ring, stopping to pose once she climbed through the ropes. Tonight was going to be quite the interesting night. Alaina made it to a corner and leaned back waiting for Panther Risako to appear. 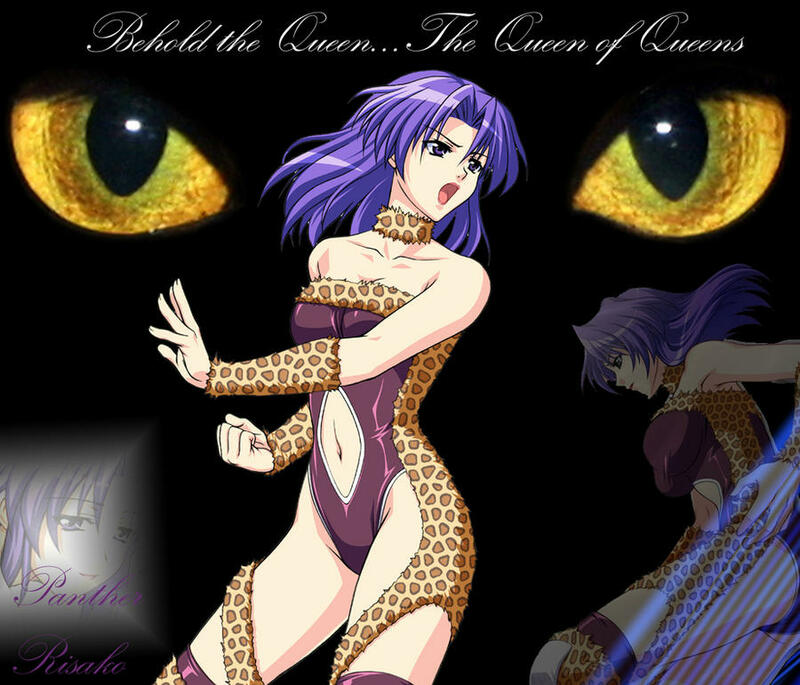 Risako's theme music began to play in the background, before the Queen of Queens herself came sauntering into the ring. Elegantly raising her arms and striking an almost balletic pose, Risako strode down the ramp as she made her way to the ring, her attention drifting towards the Amazon waiting for her in the corner. She was big, roughly on par with Chris...and given everything she had heard about her, she would not be an easy opponent in the slightest. She smiled. But then, she had dealt with tough opponents before. Sliding under the ropes, Risako took a few seconds to look Alaina over. "Miss Sanders, I presume?" she purred. "I've heard so much about you, and I must say, you are living up to what I've heard. It's too bad you chose tiger stripes for your outfit, my dear-- there is only room for one jungle cat in this ring." Around them, the audience went into a flurry of excitement as, already, Risako was bringing out the fighting words. Alaina smiled as Risako spoke, shaking her head a bit. "That would be me, and I do agree with you. At the end when the bell rings only one of us will be standing. Unfortunately for you that woman will be me." Alaina said with a shrug as she stepped forward waiting for the bell to ring. Alaina looked Panther over and was ready to take the fight to her. She wanted Risako to know what real power was going to feel like inside the ring. Alaina waited patiently and once the bell rang the amazon tried to surge forward at Panther Risako extending her arm and trying to crash into her opponent with a clothesline! Risako's eyes never left Alaina's as the other girl made her retort. "We'll have to see about that, won't we?" she replied. She began to circle, her body tensing as she readied herself to take on her powerful foe. She wasn't daunted in the slightest by her opponent's bigger size, and her body language and facial expression ensured that Alaina knew it. "Come on then, show me what you're made of, Amazon!" The bell rang, and suddenly Alaina was surging at her with a powerful clothesline. The Queen of Queens didn't even duck: instead, she simply arched backwards, letting the Amazon's arm swing over her as Alaina thundered past. Almost casually, Risako straightened back up and spun, aiming to snap her heel into Alaina's back in a blow designed to sting more than actually hurt, before stepping away from Alaina. "Care to try that again?" Risako sure did talk a lot, but she did have a point. She did gracefully dodge Alaina's opening attack and land a counter although it didn't slow Alaina down. She turned and grit her teeth eyeing Risako. Alaina shook her head as she focused again on Risako, this time reaching out with her arms and trying to grapple with the woman! Alaina wanted to get close and hammer her, trying to establish her hold and then smash Risako in the abdomen with her knee to try to stun her! Risako could tell that that last hit had only made Alaina mad-- just as it was supposed to. As Risako casually brushed her hair back, Alaina xame back again, this time looking to grapple. On the one hand, that was probably not the best idea against someone of Alaina's stature, but on the other hand, she did have an image to maintain. Alaina felt a bit of vindication as the knee strikes landed, and she had a very quick chance to try to keep taking the fight to Risako! the amazon bent down, trying to grab hold of the panther and lift her up before spinning to face the center of the ring in order to slam her to the mat as hard as she could! If successful Alaina would stand over Panther and flex before looking down at her giving a wink. "I bet they never landed them quite that hard over in Wrestle Angels did they?" Panther winced as she doubled over, clutching her midsection. Alaina hit like a ton of bricks, especially when she was in a bad mood. A simple knee strike, however, wasn't all Alaina had in her repertoire: Risako suddenly felt herself being grabbed, and before she could react, she was slammed down, hard, onto her back, the blow almost causing her to cry out in pain as she arched off the mat. The crowd went wild as Alaina suddenly took a sharp and commanding lead in the match. Seeing Alaina leaning over her, flexing and and teasing her, Risako gave her an irritated look. Moving, hopefully, too fast for the Amazon to react, Risako kicked her legs up, shifting her entire body to hopefully hammer her boots into Alaina's chest or face, before flipping back to her feet. "No," she would respond, remembering Chris Morgan. "They hit harder." Alaina was not prepared for the kick, her abdomen was smashed and the amazon groaned as she was doubled over, cradling her mid-section and hobbling back in the aftermath of Risako's strike. Alaina was caught off guard and had a feeling she was going to pay as Risako was already up and looked ready to take the fight to Alaina! Risako watched as Alaina got back up. As much as she knew it would be wise to take advantage of Alaina's downed position, at the same time, she wanted her and the Amazon to fight one another on an equal footing. Partly, this was out of a sense of honour...but partly, she wanted to demonstrate her superiority to the Amazon the in a fair, face to face battle. "Care to try that again?" Risako asked as she circled Alaina, arms extended for a lockup, her eyes boring fiercely into those of her taller opponent.